So my goal for 2019 is to find and institute one new thing every other week that can simplify my life. That will be 21 little changes that will have a huge impact on my life. One of my favorite quotes is just work to make your life 1 percent better every day… Can you imagine what you could accomplish in a year? So I am starting this year off with something very simple but impactful. We do all our laundry Saturday and work on folding it throughout the weekend. I don't know about you but I usually end up folding the easy stuff first and by the end of the pile your left with the hard and annoying things. Well for us that is socks. I spend so much time every weekend pairing socks and then rummage to find my favorite socks everyday! Now for those of you who do not know me I pride myself on my small collection of socks…ok maybe not so small collection of socks. I have lots of crazy ones and I hate when my socks match..but you know what I hate more? This math and how it works out. I estimate that I waste about 15-25 minutes a week pairing my socks then a minute a day trying to find them. So for arguments sake let's just say I waste 20 min a week on socks. That means I lose 1,070 minutes a year on socks or about 17 and a half hours to this chore that I hate! In fifty years I will have lost over a month of my life matching socks. I can think of a thousand other things I would rather be doing with my time! If you look at this picture of my collections not very minimalist of me some would say but to that I say according to the definition I use it is. Only keep the things that you know you love or you know to be useful. So actually this collection marks both of those boxes but even so, my priorities have changed and now time is more important to me. This is me changing and growing. I know for some, socks may be a simple thing but its a big thing for me (possibly due to the uniforms that I wore for 8 years of my life while attending school…oh I had it good back then and I did'n’t even know it). So that is the challenge I am taking up. My sock collection is going out the window. I will only have my favorite white ankle socks, two pair of warm socks that I will keep with my winter gear for my hiking boots and two fun pairs that I only wear on fun occasions (one from my grandma and one from my mom that sparks joy). 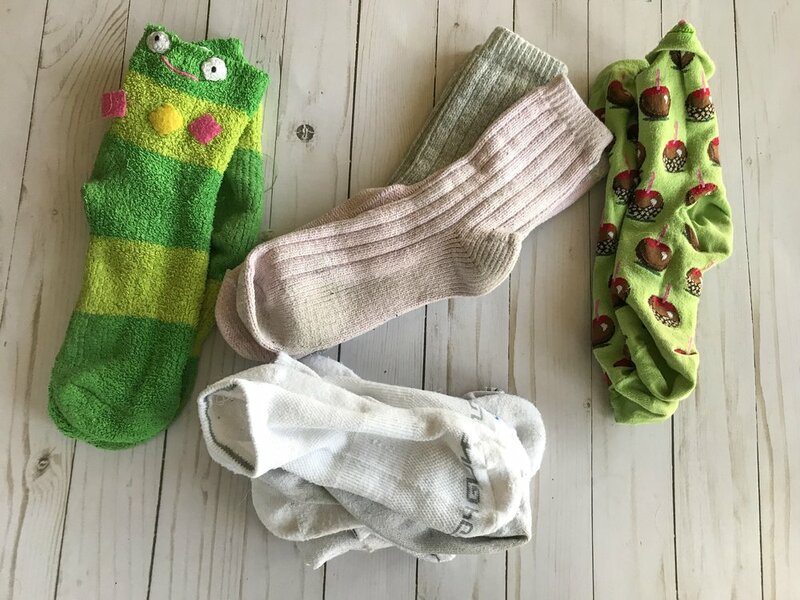 Since all my socks will be the same age and worn the same amount I won't even fold them…I will just put them all in a little box and be done with it. So far I am loving the change!